REPORT with PHOTOS etc now here. NB. In case you’re visiting this page and wondering about it, we will post REPORT with PICS asap! So check back! The second anniversary of Julian Assange, Editor in Chief of WikiLeaks, entering the Ecuadorian Embassy in London to seek political asylum is upon us on the 19th of June 2014. 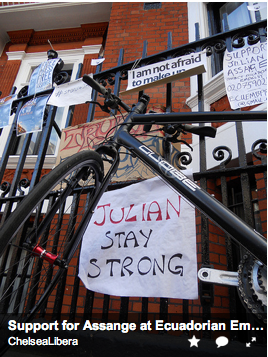 As members of the daily vigil in support of Julian Assange and WikiLeaks outside the Ecuadorian Embassy in London, we would like to invite you to a special commemoration of this anniversary, outside No 3 Hans Crescent, Knightsbridge, London on the 19th of June 2014. We send a call out to all individuals, human rights groups and organisations, members of the public, to join us in marking the anniversary, showing solidarity and thanking brave Ecuador for protecting Julian Assange’s human rights by granting him political asylum. We shall gather between 5 and 7pm outside the Ecuadorian Embassy, make short speeches, hold banners and posters, distribute flyers and engage with the passing public, informing them about our solidarity campaign. There is nothing more uplifting than joining together in action for what we believe is just. It is the only way civil society climbs up the moral ladder. Let’s take another step together. If you have never participated in our vigil before and need more information please text us at 07817 255785 and we will get in touch. 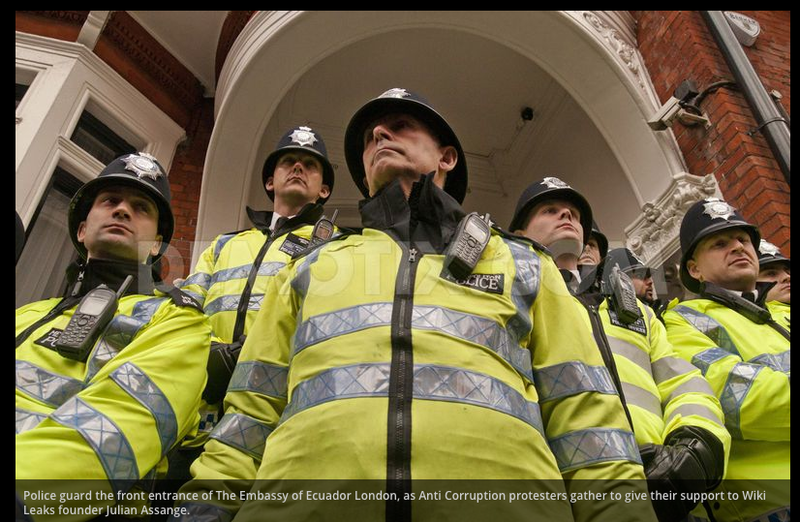 Gallery | This entry was posted in Announcements, Assange, WikiLeaks and tagged 2 years, anniversary, call-out, Ecuador, Ecuadorian Embassy, Julian Assange, London, solidarity, vigil. Bookmark the permalink.